2017 Community Did You Know? If you travel down Route 15 from Harrisburg to Dillsburg, and steer off the four lanes that carry thousands of vehicles past that community daily, and turn left at the bank and onto Baltimore Street, you’ll find a slightly slower pace. 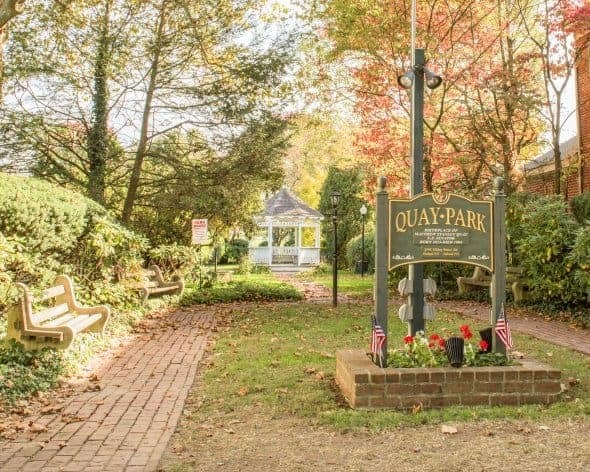 And, as you continue toward the town square where Baltimore and Harrisburg Streets intersect, you’ll pass a tiny park dedicated to one of the most powerful Pennsylvania politicians of the 19th Century, Matthew Stanley Quay. The park, easy to miss if you’re driving and not looking for it, is, in terms of size and entertainment appeal, pretty small. The restored and historic Dill Tavern up the street has more things going on and certainly more room, but Quay Park is a shaded vale in the midst of an increasingly frenetic neighborhood that allows the visitor a place to sit and reflect or to have a quiet conversation with a friend on one of the benches or in the gazebo. The park’s narrowness is delineated by a walk made of red brick pavers interspersed with tan “Dillsburg Brick” blocks. According to the slightly paradoxically titled journal, Brick Vol, 25 in 1906, it was noted that “The Dillsburg Vitrified Brick Company was planning to enlarge its business to making 30,000 bricks a day.” The company is believed to have been located off Mountain Road at Homewood Street in Carroll Township across Route 15 from Dillsburg. The park’s conservators are the members of the General Federation of Women’s Clubs – Dillsburg Woman’s Club who developed the park in 1975 and provided the gazebo. But what about the man for whom Quay Park is named? Matthew Stanley Quay (1833–1904) was born in Dillsburg and, in the latter decades of the 19th Century, was one of the most powerful political figures in America. Called a “kingmaker” by President Benjamin Harrison, “Matt” Quay flourished in an era when politics was not under the microscopic scrutiny of the press as it is today. The son of a Presbyterian minister, Anderson B. Quay, the younger Quay spent his formative years residing in the brick house next door to Quay Park. His childhood home, now on the National Register of Historic Places, was built in 1831. And, when first built, the only neighbor was an 18th Century log house next door, presumably where the Reverend Quay and his wife lived while their brick house next door was being constructed. The log house, which appears on mid-19th Century maps of Dillsburg, passed through a number of owners until, due to its deteriorated condition, it was demolished in the 1950s. Despite the loss of a bit of history with the destruction of a log house built in the 1700s, the vacant, if narrow, lot that remained provided the space for Quay Park. As the son of a cleric, Matt Quay was educated at private schools, attending both Beaver and Indiana Academies and eventually graduating from Jefferson College (now Washington and Jefferson College) in 1850 at the age of 17. After studying law he was admitted to the bar in 1854. His first position in politics occurred with his election to the Pennsylvania House of Representatives representing Beaver County. His political career was interrupted by the Civil War where he was commissioned a colonel with the 134th Pennsylvania Volunteers, serving in various capacities, including Assistant Commissary General of Pennsylvania. Despite his somewhat mundane-sounding tasks with the military, Quay proved himself no slouch under fire. He was awarded the Congressional Medal of Honor for his performance during the battle of Fredericksburg in 1862. His efforts during the Civil War attracted the attention of Pennsylvania Governor Andrew Curtin, who was impressed by Quay’s work, and resultant popularity, with soldiers from the Commonwealth. Matt Quay’s shift from being a Beaver County attorney to a member of the inner circle of Pennsylvania’s political controllers became evident when he became a trusted associate of Republican boss Simon Cameron. Quay’s rise to national prominence came in 1888 when, as campaign manager for Republican presidential candidate Benjamin Harrison. With Quay’s guidance, Harrison narrowly defeated the incumbent, Grover Cleveland, winning the Electoral College while losing the popular vote. Quay hired poll watchers to observe voter fraud in Democratic New York City in Cleveland’s home state of New York while allowing it run rampant in Republican Philadelphia. Triumphant in the success of the presidential election, Quay directed the strategy giving Republicans control of the House of Representatives, gaining nineteen seats. In addition to it all, Quay managed to get himself elected United States Senator from Pennsylvania in 1887, a seat he held, while serving as chairman of the Republican National Committee from 1888 to 1891, until 1899. He was again elected to the Senate in 1901. Quay’s laissez faire approach to government was called into question when he was brought to trial on a charge of misappropriating state funds in 1898, although he was acquitted the following year. A rift in the party he controlled, between the reformers and the faithful resulted in a deadlock over filling his vacant Senate seat. To resolve the issue, Governor William Stone appointed Quay to fill his own vacancy, and, upon presenting his credentials to the U.S. Senate in December 1899, his colleagues refused to seat him, declaring that he was not entitled to the seat. Pennsylvania held a special election to fill the vacancy, not surprisingly, electing Matt Quay. However, the turn of the century also signaled the wane of one of Pennsylvania’s most powerful and colorful political bosses, with the machine being entrusted to the able hands of Boise Penrose upon Matthew Quay’s death in 1904. Although he spent most of his life as a resident of Beaver County (his home in Beaver, PA is on the list of National Historic Landmarks) and a political career played out in Harrisburg that was – to say the very least – colorful, the town of Dillsburg can justifiably claim him as their very own. And the park dedicated to his memory? It awaits you.